Planet Earth taken from space. We obviously know more about Earth than any of the other planets. Earth is the largest of the four terrestrial planets, the other terrestrial planets being Mercury, Venus, and Mars. By terrestrial planet we mean that Earth has a hard rocky surface. The composition of the Earth is similar to other terrestrial planets in that it has an iron-core which is surrounded by a molten mantle which, in turn, is surrounded by an outer crust. We live on top of the crust. There are many things that make Earth unique among the Solar System's planets. First, Earth is the only planet that we know of that contains life. Not only does earth contain life, but it supports millions of different forms of life. Another difference is that the Earth is mostly covered with water. Around 71% of the Earth is covered with salt water oceans. Earth is the only planet that has water in liquid form on it's surface. Also, the Earth's atmosphere is made up of mostly nitrogen and oxygen while Venus' and Mars' atmospheres are made up mostly of carbon dioxide. Satellite picture of the continent of Africa. The earth has seven large land masses called continents. The continents include Africa, Asia, North America, South America, Europe, Oceania, and Antarctica. It also has 5 major bodies of water called oceans including the Atlantic, Pacific, Indian, Southern, and Arctic oceans. The highest point above sea level on Earth is Mount Everest and the lowest point is the Mariana Trench. The Earth is composed of a number of layers. On the outside is a rocky layer called the Earth's crust. Below this is the mantle followed by the outer core and the inner core. Planet Earth is made up of a number of elements. The central core of the Earth is made of mostly iron and nickel. The outer crust of the earth consists of a number of elements. The most abundant are oxygen (46%), silicon (27.7%), aluminum (8.1%), iron (5%), and calcium (3.6%). Earth has one moon or natural satellite. You've probably seen it! The Earth's moon is the fifth largest moon in the solar system. 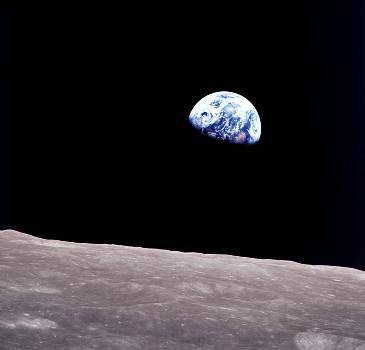 Earth viewed from the Moon's orbit. You may think that the earth is a perfect circle, but it is actually an oblate spheroid. This is because the middle of the Earth or the equator bulges out slightly due to the spin of the Earth. The inner core of the Earth is hotter than the surface of the Sun. It is the fifth largest of the eight planets. Small earthquakes are happening somewhere on the Earth all the time. The Earth orbits the Sun at a speed of 67,000 miles per hour.